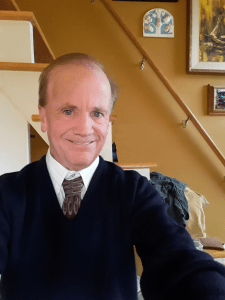 Living with severe asthma for 64 years and why I created this blog. My name is Steve, I was born 6 and a half decades ago with wickedly severe asthma. I’ve been hospitalized well over 100 times for the disease and was not expected to survive past my mid-forties. While it’s true that I suffer a lot from this disease, I refuse to be a prisoner of it. Back in 2004 with my health rapidly failing and limited treatment options available, rather than lay around feeling sorry for myself, I decided to experiment with incorporating exercise, in the form of walking, into my daily treatment regime. In doing so, I improved not only my own health but changed the world narrative on physical fitness and chronic lung disease management. 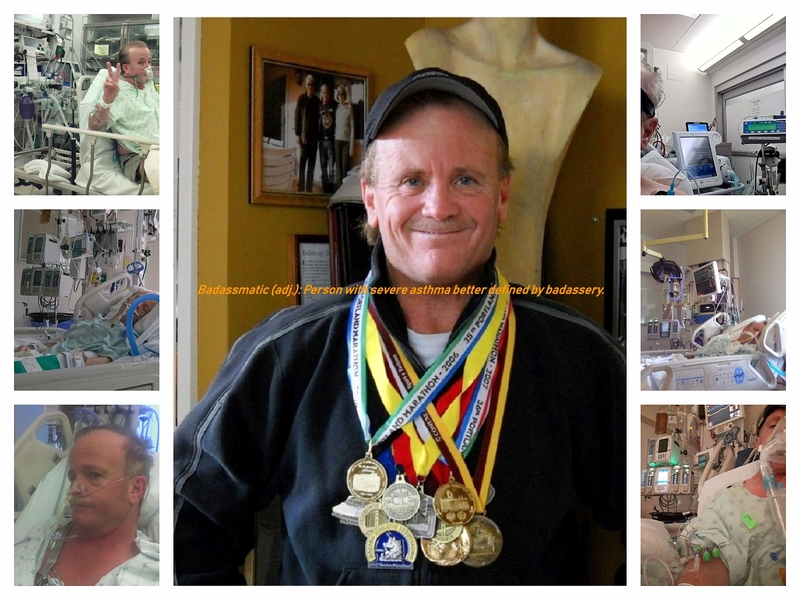 With hard work, discipline and sheer determination, I completed 21-foot races, including 9 full marathons in a span of just 8 years, all with a permanent lung function (FEV1) of less than one-third of normal. That’s right, I have a hard time breathing almost all the time and I’ve completed not one, but 9 full marathons! Before I continue with the back story, let me clarify a couple things. First, I didn’t run any of these marathons. In fact, I can’t run at all…I just don’t have the lung capacity to do so. But what I found is that I could slowly condition myself, with my lungs the way they are, to walk at a moderate pace for increasingly longer periods of time without getting dangerously short of breath. That’s pretty much how I trained for those races and that’s how I completed them…. by walking them! Of course, I can’t walk as fast as a fast healthy runner can run, but I still cover the same 26.2- mile marathon distance and it only takes me about twice as long. Secondly, I’m neither a natural born athlete nor some freak of nature who’s able to walk marathon distances despite very low lung function. Truth is, I’ve worked extraordinarily hard at conditioning myself and building up the endurance needed to reach the goal of completing a marathon distance. I’ve learned over the years not to let my breathlessness make me overly anxious or dictate what I can or cannot do, physically or mentally. I know the risks involved in doing strenuous exercise, I take precautions, I learn what works for me, and then I try my best to adapt. The only advantage that I might have over others who have breathing problems, is that I’ve had mine since early childhood. That said, my walking story and the birth of this blog begins in Sept of 2004, when my asthma got so bad that I was forced to take early retirement from my career as a Respiratory Therapist.At the age of 49, physically disabled and now jobless, I became super depressed, constantly sick and totally out of shape. Then one day it occurred to me, people with COPD are encouraged to attend pulmonary rehab classes and exercise to slow their disease progression and improve the quality of their lives, so why not people with severe asthma? The diseases may have different causes, but they share many similarities. With that in mind, and plenty of time on my hands, I came up with an aerobic exercise program for myself, that would hopefully add some structure to my days, help me manage the viscous dyspnea cycle, maintain what little lung function I still had left, and perhaps beat the odds by living longer and happier than science and medicine says I’m supposed to. At first, I tried swimming and slow jogging, but those activities left me severely winded. In the end I chose good old fashioned walking. Little did I know what a profound affect this would have on my life. When I first started walking for fitness I was in such bad shape I could barely go a few blocks without suffocating; and on many days I was too short of breath to walk at all. Despite the concerns and doubts of some, I kept pushing myself to go a little farther each time. I even took up racewalking lessons to learn the science of walking and to improve my speed and technique. A year later on 7-31-2005, I walked 13.1 miles in under 3 hours, successfully completing my first half marathon. Then just a little over a year after that on 10-1-2006, just 2 weeks after an asthma hospitalization and an FEV1 of 36%, I did what others said was not possible….. I completed a 26.2-mile walk and finished the Portland Marathon! Since then, I’ve gone on to finish a dozen other races, including the Rome marathon in Italy(twice), and on April 20th 2009, I walked my way into the record books by becoming the first person with documented severe refractory asthma, ever to finish the Boston marathon! 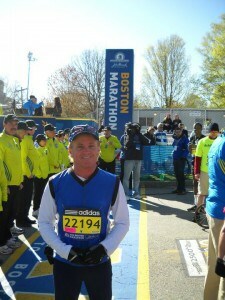 In 2010 and 2011, I finished my 2nd and 3rd consecutive Boston marathons, finishing each race appx 12 minutes faster than the previous. Alas, while I still consider myself a Badass-matic, 64 years of near constant asthma exacerbations and all the medications used to treat them, has taken quite a toll. Since completing my last full marathon in the fall of 2014, I’ve had to set less lofty fitness goals for myself. My lungs are so damaged now that I’m short of breath all the time, and the slightest trigger can throw me over the edge. I don’t see any more marathons in my future, but my message is still relevant. If you have lung disease, you need to stay active. As counter-intuitive as it might sound, you need to exercise, even when you have a disease that affects your breathing. Walking for fitness hasn’t cured my asthma, but it’s certainly made me a stronger person and I believe it’s the main reason I’m still around to write about it. As I see it, you have two choices when it comes to chronic breathing problems, you push on with life despite the difficulties and find ways to adapt, or you let the disease gradually consume you and make your life miserable. Plain and simple. If you have asthma, please consider becoming a volunteer subject for SARP or some other Asthma research study. It’s so important.